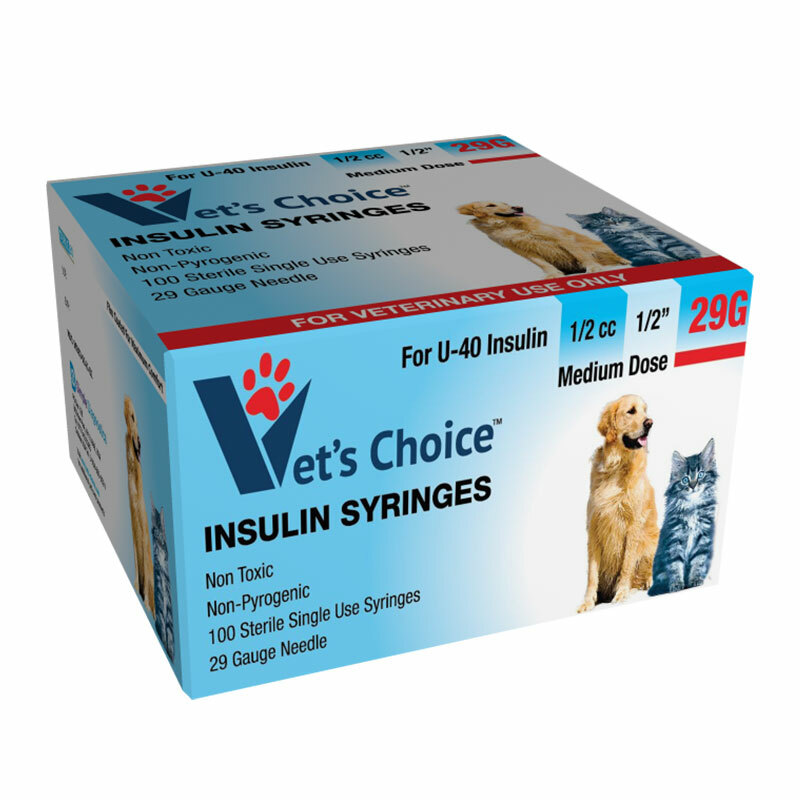 Vet's Choice U-40 Insulin Syringes For Your Pet - 29 Gauge 1/2cc 1/2inch (12.7 mm) needle V2955, 100 Single use syringes (10 packs). Case of 5. Vet's Choice pet syringes are precision engineered to provide superior comfort for your pet. The Vet's Choice U-40 Insulin Syringe is film coated for maximum comfort and lines up precisely for accurate readings. There is no “dead space” for accurate dosage and less waste. When choosing insulin syringes always make certain that the concentration of the insulin you are using works with the syringes you are using. The vial of insulin and packages of syringes will be clearly marked as U-40 or U-100. You never want to mix these - always use U-40 insulin with U-40 syringes and U-100 insulin with U-100 syringes. These syringes are to only be used with U-40 insulin. Do not sterilize or reuse syringe. Buy pet insulin syringes at discounted prices only at ADW Diabetes – your one-stop destination for all your diabetic supplies. Lowest Cost & Reliable Auto-Ship! Our maltipoo’s sudden diabetes and blindness was a terrible shock — but after excellent Vet treatment & affordable supplies from ADW, life is good again & we couldn’t be happier! Best for my little girl!